Sweet Finds, Annual Food Day, Mini-Dessert Shockers & MORE! Items SO Good, They're Worth Ordering on the Web! 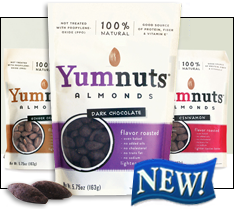 Yumnuts Almonds - We've been fans of this company's flavored cashews for years, and now Yumnuts has branched out to almonds! Choose from Dark Chocolate (with a thin layer of cocoa, not an actual chocolate shell), Cinnamon (with molasses and allspice too! ), and Ginger Orange (don't be scared -- the flavor is mild and really delicious). Each 1-oz. serving (about 17 nuts) has 150 calories, 11g fat, 0mg sodium, 10 - 11g carbs, 3g fiber, 5 - 7g sugars, and 5g protein (PointsPlus® value 4*). YUM is right! Click to buy, and try the cashews too! 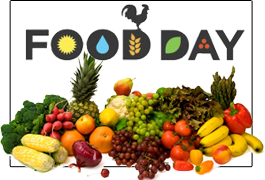 Today, October 24th, Is the First Annual Food Day! For us, pretty much EVERY day is Food Day, but our pals at the Center for Science in the Public Interest have a loftier idea in mind. They've declared that October 24th (a.k.a. today, for those of you who aren't good with calendars) is Food Day -- a day to encourage Americans to "eat real" and support the goal of making healthy, affordable food (produced in a sustainable, humane way) a reality for everyone. Like Earth Day, but for food. Get it? Good! There are tons of Food Day events scheduled for today across the country -- click here and enter your zip code to see what's happening near you! Can't attend an event? You can still work on your own eating habits. Eat plenty of whole grains, fruit, and veggies; keep soft drinks, salty foods, and fatty meats to a minimum. (This goes for you AND the rest of your family!) Here are a few fun recipes featuring natural ingredients. And shopping at local farmers' markets is a great way to help support your health and your community. YAY, FOOD! How Will YOU Celebrate Food Day? 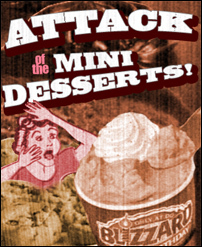 Just in Time for Halloween: Attack of the MINI DESSERTS! Baskin-Robbins Cake Bites - Individual li'l portions of ice cream cake coated with chocolate -- great, right? WRONG! Get this -- ONE "bite" has 310 - 360 calories and 18 - 22g fat! HOW is that a bite? Those are fast-food burger stats! Dairy Queen Mini Pumpkin Pie Blizzard - The current Blizzard of the Month is packed with seasonal flavors... as well as 370 calories and 14g fat... in a MINI. Come on, DQ -- in the words of Lady Gaga, "Don't be a drag, just be a queen..."
Heads up, pet owners! With Halloween coming up next week, take precautions to make sure your furry babies (dogs, cats, etc.) stay safe. Keep the candy out of reach! That stuff, especially chocolate and treats made with the sweetener xylitol, can be very dangerous to animals. Click here for more Halloween safety tips from the ASPCA! ***HG regulars know that we're big proponents of eating lots of lean protein, and new data suggests extra benefits to add to the list of the nutrient's pros. A recent study shows that consuming a significant amount of one's calories from protein could lead a person to take in fewer calories overall. See? EAT PROTEIN! ***If you're a fan of Fiber One bars who has nut allergies, listen up. General Mills is voluntarily recalling select Fiber One 90 Calorie Chewy Bars because some of the Chocolate Peanut Butter bars were put into boxes marked Chocolate. Click for the full info! ***According to the Daily Mail, a new poll suggests that women who start a diet on a Tuesday are the most likely to give up within a week AND to potentially gain weight. Apparently, Sunday and Monday are the best days to begin. We're not sure how accurate this information is, but it's an interesting idea... ***Up next on the Hungry Girl Supermarket Survival book tour... San Antonio, Texas! Lisa (HG herself) will be at the H-E-B Plus! on North Loop 1604 West tomorrow (Tuesday the 25th) at 6 p.m., signing books, giving away snacks, awarding prizes, and doling out more can't-miss fun. So be there! Later in the week, it's on to Austin, TX, and Seattle, WA. Click here for ALL the event info! That's all we've got. HG out! 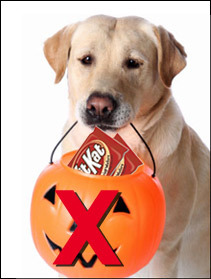 No Kit Kats for Fido! Extra, extra! Click "Send to a Friend" to pass around this news -- no paperboy required! Today, October 24th, is National Good and Plenty Day! With Halloween just one week away, we're letting you know now that a 33-piece serving of Good & Plenty candy has 140 fat-free calories. Not bad!